The Library is available online. CLICK HERE to browse it..
- The old way to take screen shots. 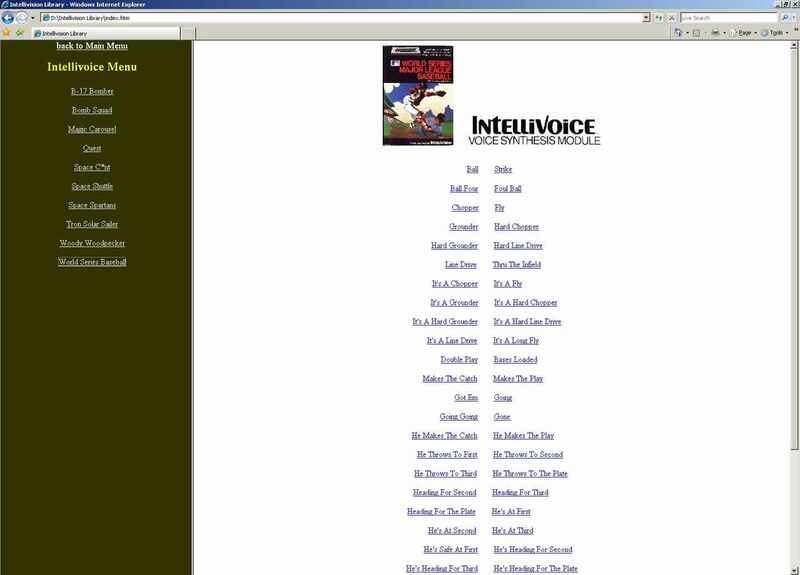 - The Intellivision Library is available on DVD and CD. - It is menu driven that was created in HTML. - The main categories are: Advertisements, Catalogs, Games, Images, IntelliVoice, Magazines, Manuals, Miscellaneous, Newsletters, Press-Kits, and Videos. - Tested in 1024x768 resolution. - Q: I click on zoom and the images are still blurry. Why? - A: Not all images are in high resolution. This is due to originals not being available for scan. - Q: Where are the rest of the images? - A: You need to scroll down the page to see all the images. Most pages have more than one image but not all do. 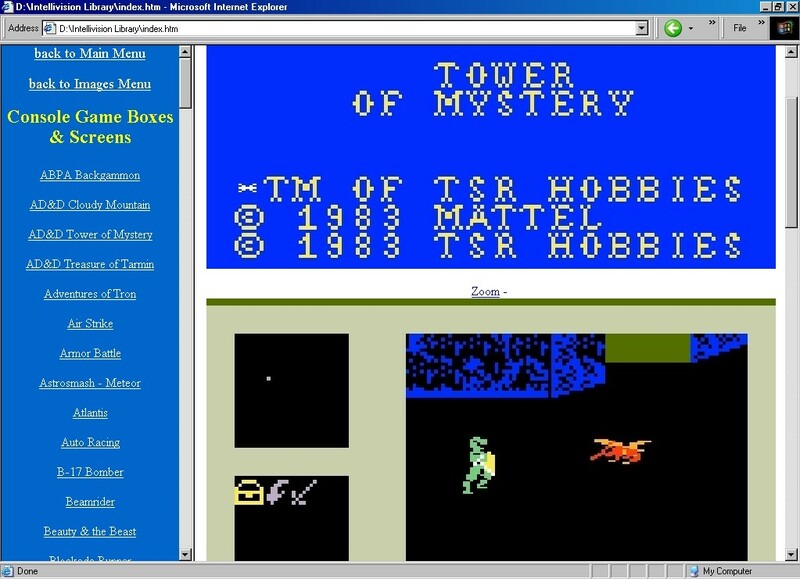 - Q: Why sell a Library of Intellivision images when I can already get them on the Internet? - A: Not everything is available to everyone. The Library is the only place you will see a complete Keyboard Component collection, many unreleased games, hear every Intellivoice audio track, and more. You are guaranteed to find something in the Library that you have never seen/heard before. - Q: Why not make the Library available on the Internet? - A: I always believe having a 'hard copy' is always better than a virtual copy. There is an older release of the Library available for viewing online. See the link at the top of this page. The following titles which were developed by Mattel in the 80's have been well documented in the Library. They were never available until now. Mike D. - WOW! Lots of great information in one place! And very valuable since we have seen that websites can come and go far too frequently. Looking at it, it quickly becomes apparent this effort is a labor of love. Everyone who has worked on this –particularly David who put it all together – deserves a lot of thanks (""dap,"" ""mad props,"" whatever the kids are saying today 8*>). Hopefully this will help us preserve the history of our favorite system. And hopefully others will come forward and do their part to help fill the few missing gaps! 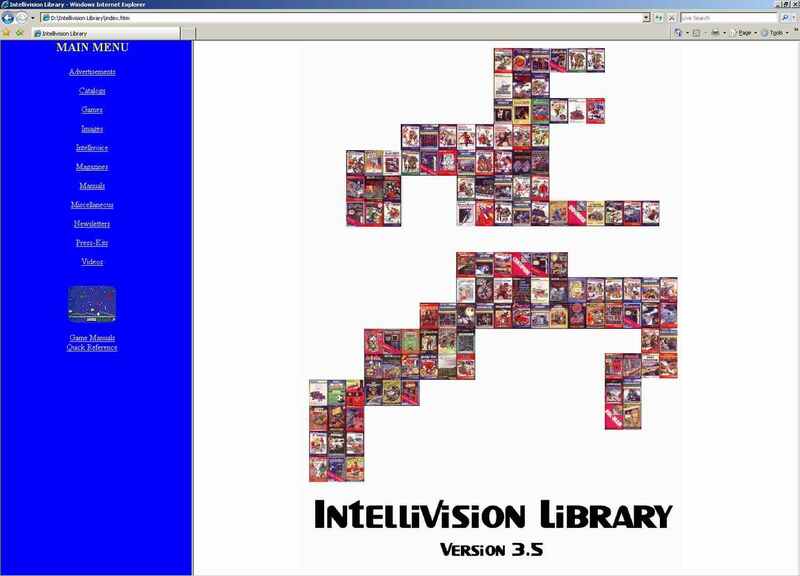 Pete S. - Awesome DVD jammed full of Intellivision items - from the common to the ultra-rare. It takes awhile for it to soak in. It's good to have all this information in one place! Great job! 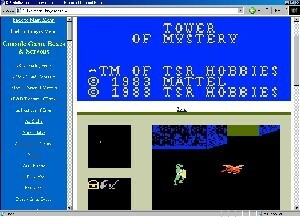 Ryan K. - AI just spent a large portion of my weekend going through the Intellivision Library DVD-ROM. Wow!! This is incredible to have all of this material in one place. I am in awe over the insane amount of time you must have put into scanning and preparing all of this. It'll take me ages to appreciate everything you've fit on there. I have been watching the internet for years in search of every morsel of Intellivision information that I could find - and this blows me away to see so many new things all at one time. Simone R. - This Library is a treassSSSssure!! A must for all the Intellivision collectors! There are images of items that the most fans have never seen; and images of items that 15 years ago some of us (I am one of them) had lost the hope to see. How impressed I was by the images of unreleased games! Illusions, Rocky And Bullwinkle, Spina The Bee! Many thanks to David for this tribute to our “baby”. Superb!